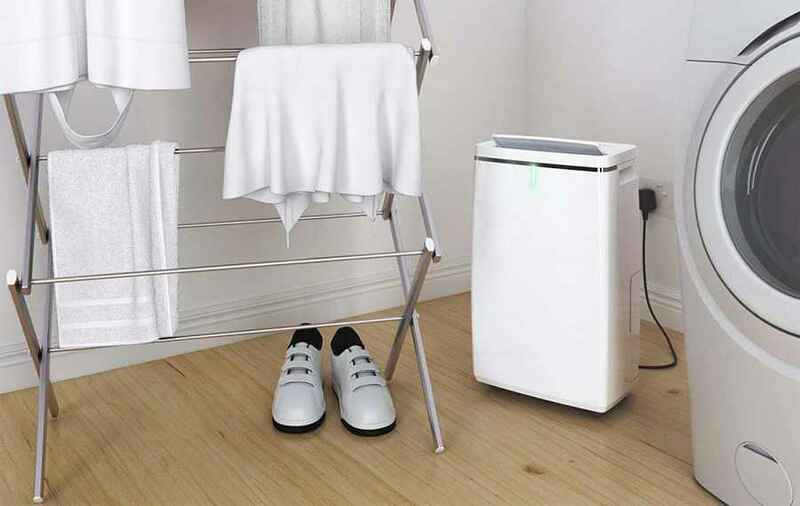 Vax is another brand that manufactures dehumidifiers built with UK weather conditions in mind. Their impressive lineup of dehumidifiers can meet just about every budget and requirement. But, if you are looking for one of the best creations from this brand, then the Vax DCS2V1MP Power Extract 16L dehumidifier is worth checking out. Much like the Ebac 2250e, the Vax DCS2V1MP dehumidifier features impressive water extraction, a heavy build and a large water collection tank. This model also has castor wheels, which makes it easier to transport compared to the aforementioned dehumidifier. 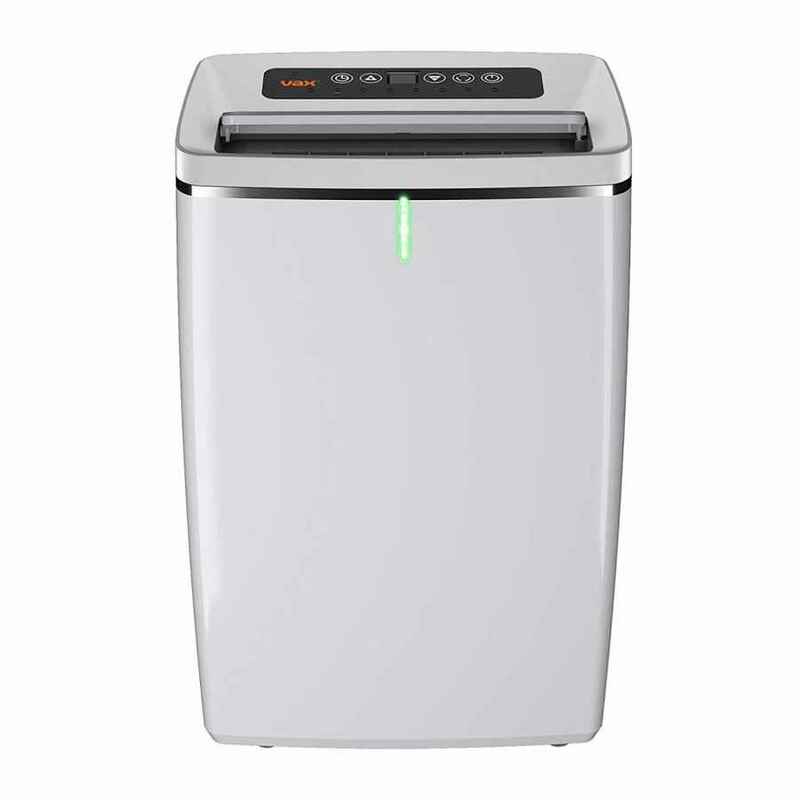 It also sits nicely as the middle unit of Vax’s Power Extract range of dehumidifiers. The Vax DCS2V1MP may stand as a less powerful unit but it is more affordable and equally feature-packed as the top model in this range, (the DCS3V1HP Power Extract dehumidifier). As such, this makes it one of the best options from the Vax Power Extract dehumidifiers when it comes to a good balance between price tag and features. So, what do you need to know before you buy? Here is what we found out. Taking on the standard rectangular box style of dehumidifiers with a sleek and modern finish, the Vax DCS2VIMP unit is not ugly but it will not be winning in a dehumidifier style contest either. 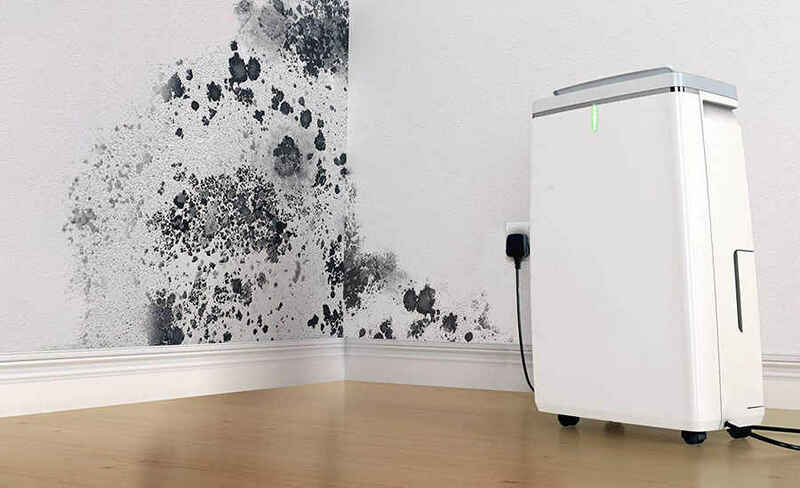 What this unit has a shot at winning though is the title of the best-designed dehumidifier. 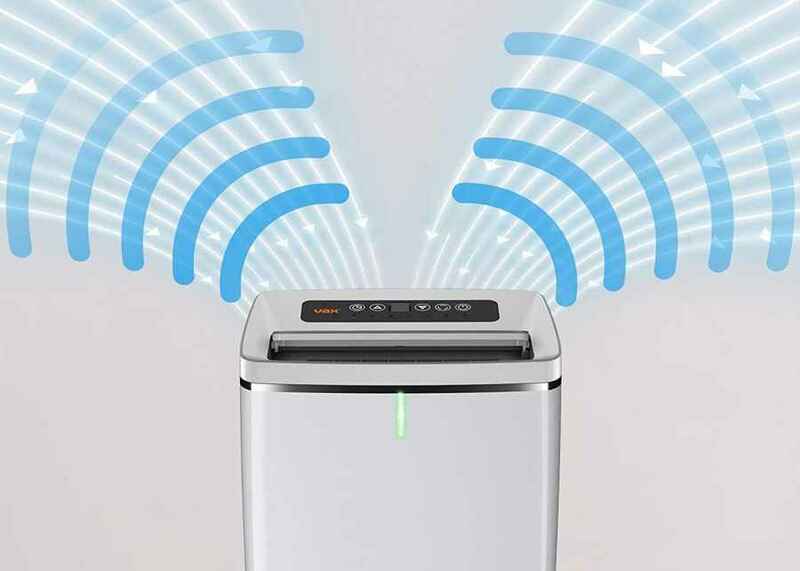 There is a lot to love about this dehumidifier from its quick release hidden water tank, to the washable filter, to the popup air filter cover. The design feature we deemed most useful, however, is the digital control panel with LED display, which is located at the top of the dehumidifier. Thanks to this control panel, all functions of the dehumidifier are simply a touch away. The panel is highly sensitive however, so you only need to press the controls lightly. When the Vax DCS2V1MP is plugged in, the digital display panel comes to life displaying 5 touch buttons that are self-explanatory even without looking at the user manual. The DCS2V1MP’s control panel is simple & intuitive & is similar in format to some Meaco and EcoDry dehumidifiers. They include a power button (with the usual power symbol), plus & minus buttons (with accompanying + and – symbols) for setting the target humidity threshold, and a button with a clock symbol for setting the unit’s timer function. The fifth ‘Program’ button gives you access to the 4 pre-set (Auto day, Clothes dry, Fan only, & Night) modes of the DCS2V1MP dehumidifier. The panel also displays a series of light indicators for the timer function, tank, all 4 modes of operation, plus for showing whether the dehumidifier is ON or at standby. The LED lights all illuminate over the respective selected function names. This DCS2V1MP Power Extract unit is also purposefully designed to be portable despite its slightly bulky nature. Weighing in at 14.6 kgs this dehumidifier would be trickly for many people to carry but thanks to an carry grips, this task is made a little easier. The ‘grips’ consists of 2 deep recesses etched on either side of the rear of the unit. They provide a nice place for you to grip and lift the dehumidifier with both hands and is a good half-way house between an actual carry handle and only one recessed grip found on other dehumidifiers. These grips also make it possible for 2 people to carry the dehumidifier to help lighten the load. That said, you do not need to lift the unit every time you want it moved. Located on the base of this dehumidifier are a set of castors that provide you with the option of simply pushing or pulling it into whatever position/room you need it. The water extraction rate on this Vax DCS2V1MP Power Extract is an very respectable 16 litres per day in rooms of up to 25 m2. Vax do not provides specifics on the test conditions that led up to the arrival of this extraction rate. However, we can assume that like most dehumidifiers, this 16-litre unit from Vax was tested under a humid tropical climate. So, unless you have a very severe damp problem in a a very warm home (or a drying laundry) it is unlikely to expel the full 16 litres every day. It is also normal for the dehumidifier to collect less water with time. This is because the unit works hard during the first few uses to eliminate excess moisture from your home. As a result, the rooms in the house will become drier and as such have less water to be drawn out. The good news though is that Vax has made it possible for you to know with certainty if the dehumidifier is working well in your home regardless of how many litres of water you get at the end of the day. For starters, the unit displays the current humidity of a room on a small box section (located between the + and – buttons) on the digital panel. There is also a 3-colour light indicator on the unit’s body that allows you to know the current humidity status of a room at a glance. The light indicator shines red if the room is wet, blue when it is too dry for comfort, and green when the optimum humidity level is reached. So, you will always know if the air in your home is comfortable and thus make changes when it’s not. The unit has a flexible humidistat, which can be set over a range of 80% to 30% relative humidity. The controls to use for this are the + and – touch buttons where adjustments happen in increments/decrements of 5%. With the ideal relative humidity for health and comfort placed at around 50-55%, you have plenty of options to keep your home at a level that is comfortable for you. We’d always recommend starting with the dehumidifier on the highest setting (to deal with damp quickly) and then gradually reduce this over time until you find the perfect setting that leaves your home sitting within the ideal 50%(ish) range. Featuring a 5.5-litre water tank, emptying the Vax DCS2V1MP is as good as it gets. 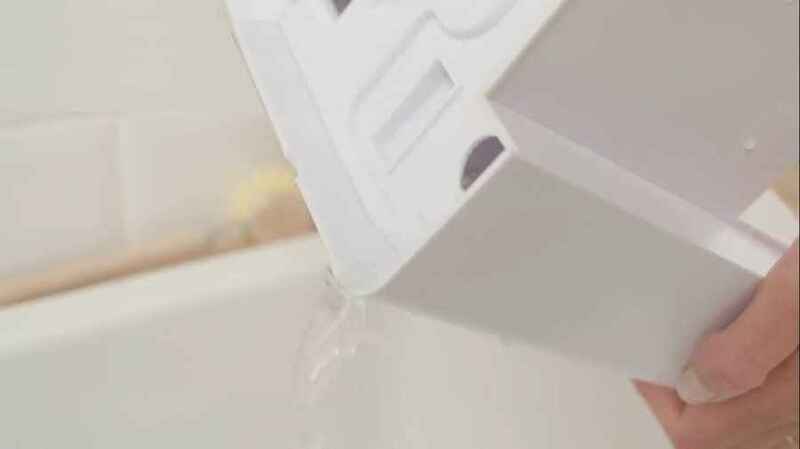 Depending on the conditions in your home, you can leave the dehumidifier on its own for a lengthy period – ranging from half a day to 2 or even 3 days straight without needing to empty the tank. But if you’d like to leave it for longer periods unattended (or simply don’t want to empty the tank at all), a drainage tube is also provided which you can use to set-up of continuous drainage – provided you can located your dehumidifier near a sink or appropriate drainage spot. The Vax DCS2V1MP provides all the usual functions of a dehumidifier of its class and a couple of extra useful ones as a bonus. First off, is the typical daily dehumidifying function, which is quite fast and removes everything in the air from moisture to condensation and dampness while also stopping the growth and/or spread of mould and mildew. Vax also throws in an extra dehumidifying setting in the form of a ‘Night mode’. This mode basically seeks to make the dehumidifier less of a nuisance. It operates with most of the LED lights switched off and the fan on a low (and therefore less noisy) speed that makes it easier for everyone to sleep as the dehumidifier gently whirrs away. The other two settings of this dehumidifier include ‘clothes drying’ and ‘fan only’ modes. Both do a great job with the clothes dry mode being designed to be powerful and energy efficient at the same time. It runs on the highest fan speed with current humidity setting turned off to ensure full and quick water extraction and then automatically switches off after 4 hours. The fan mode, in turn, is powerful enough to take care of cooling your home over summer. When activated, moisture extraction automatically stops and the air is made to circulate around a room. There is an air outlet cover at the top of the unit, which you can adjust to direct the flow of air to some extent for a better cooling effect. Another nice inclusion by Vax is a Smart Air Sensor fitted into the dehumidifier, which works hand-in-hand with both the daily and night modes. The sensor monitors the air in a room and then adjusts the dehumidifier to run between high and low fan speeds sometimes even switching off entirely depending on how far or close it is from reaching the set humidity. This helps make the DCS2V1MP Power Extract a little more energy efficient, which is great given its powerful 370W power rating. Although this Vax DCS2V1MP automatically switches on and off when dehumidifying a room, the only time the unit will shut off completely is when the tank is full. The rest of the time, it will run continuously day and night. This can be a waste of energy for instances when you are not around which is why a 24-hour programmable timer function is included. It is essential a money-saving feature that provides some degree of automation. For example, you can simply set the unit to run from the time you get home to when you leave the following morning and forget about it until you come back home the next evening. Alternatively, you can program the dehumidifier to switch off at a certain time when you are about to go on a trip in case you forget to switch it off on your way out to work. 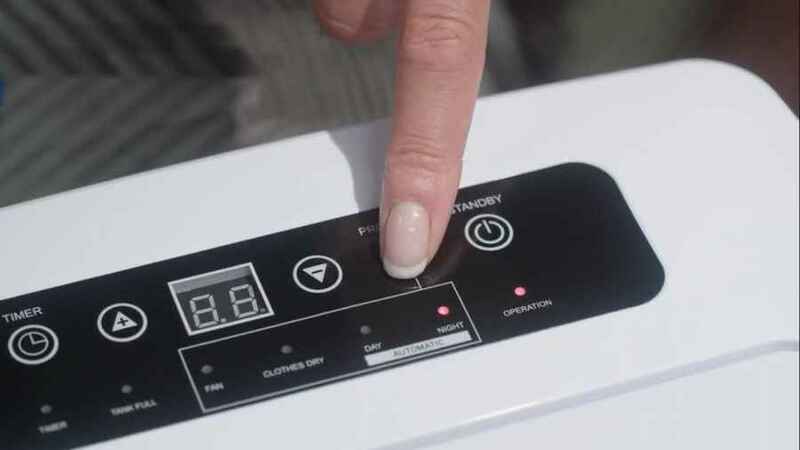 The pre-timed clothes drying mode is also subject to alteration through the timer. However, you can only extend the preset 4-hour laundry time to a maximum of 12 hours. 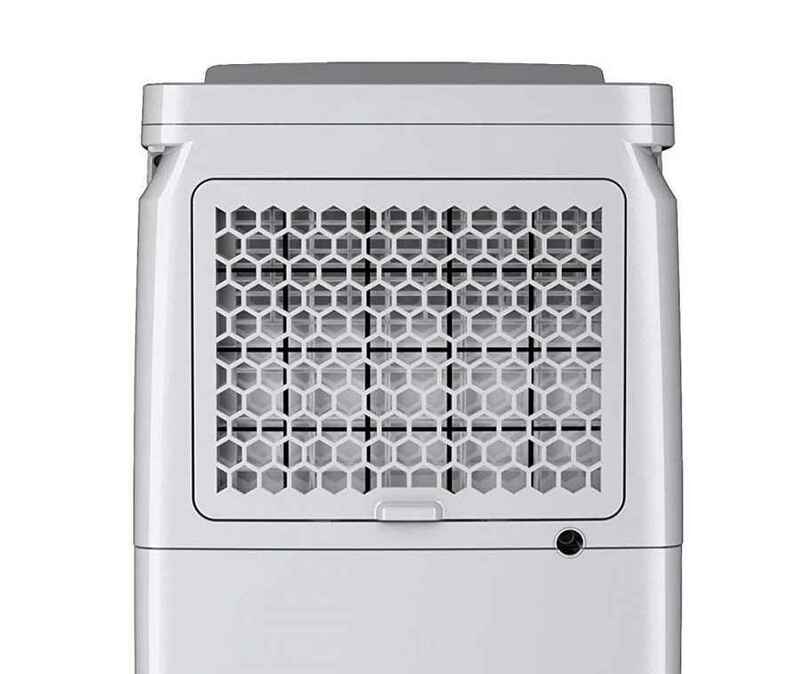 A removable filter found at the back of the unit is another feature that is included on the dehumidifier. The filter is not that versatile though as it only traps dust and other allergy-triggering particles. As mentioned, the filter is removable and as such needs regular replacement. This, however, will not be as often as with other dehumidifiers like the Ebac 2250e whose filter needs replacing every 3 months. The filter on this unit has a better lifespan of 6 months – although supplying a washable filter would have been more preferable. Like all products, this dehumidifier has both supporters and nay-sayers. The general view, however, is that when it works, the DCS2V1MP Power Extract is great. According to users, water extraction is impressive, the fan is powerful, and the design is lovely (especially the colour change for humidity level). A bit of caution from customers, however, is that the dehumidifier is loud (some users even claim the night mode does not do much in reducing noise levels), the continuous drainage hose is not adequately long, and that the control panel can be a little temperamental so you will need some patience. The Vax Power Extractor certainly has some useful features – such as the night mode. It is also one of the few units that come with the advantages of doubling up as a fan and providing real-time feedback on a room’s moisture and humidity levels. All this makes the dehumidifier fairly impressive. Therefore, if you can put up with a few downfalls like noisy operation (although, with the exception of the MeacoDRY ABC, range this is a common complaint to every dehumidifier), and higher power usage, the Vax DCS2V1MP is a quality dehumidifier. It is powerful, smart, and fairly easy to use.